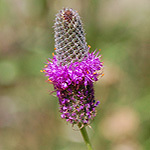 Purple Prairie Clover is a native, erect, perennial forb growing on slender, stems usually under 2 feet tall (range 8 to 35 inches). 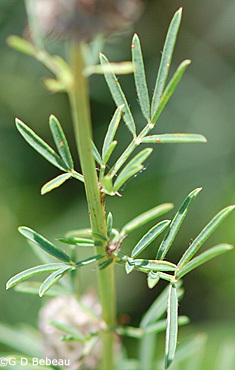 Stems are usually hairless but some plants may have dense short hair; stems are pale green with vertical ridge lines. 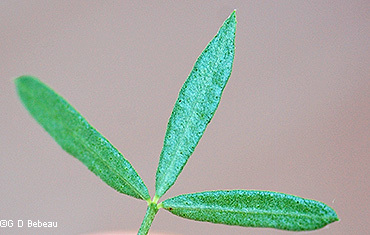 Mature plants will frequently have many stems rising from the base. 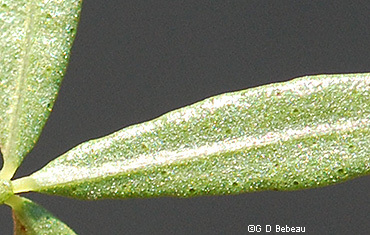 The leaves are pinnately compound with an odd number of narrow leaflets (3 to 9 but usually 5), hairless, with each leaflet being about 1 inch long, only 1/8 inch wide, having smooth margins and translucent gland dots on the underside. All but the smallest upper leaves will be stalked and the small uppers may have only 3 lobes. 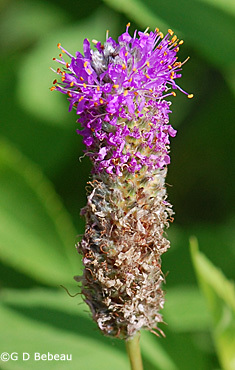 The inflorescence is a dense cone-shaped spike, 1 to 2 inches long on a stalk held above the leaves. If branched, side stems will also have a spike. 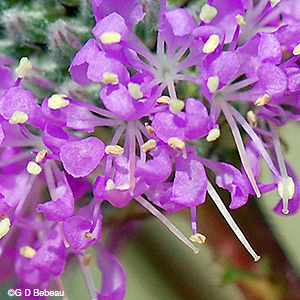 The flowers are small 1/4 inch 5-part, with a green calyx and purple corollas. The stamens number 5, have greenish-purple filaments and usually pale orange anthers. The pinkish-white style is longer than the stamens. The petals of the corolla have an upright banner like most Pea family flowers, but the other 4 petals are much reduced allowing the stamens and style to be visible and exserted from the corolla. Flowers open from the bottom of the spike to the top. Seed: Bumblebees and other bees will pollinate the flowers which when fertile, produce a small dry thin hairy seed pod, containing one or two smooth irregularly shaped seeds, which are dispersed by the wind when mature, falling close to the plant. Seeds typically germinate in warm soil without the need for cold stratification. Varieties: There are two, see note below the photo section. Habitat: Purple Prairie Clover has a taproot that can extend to 6-1/2 feet deep and many smaller fibrous roots making it drought tolerant, but it grows best in full sun where there is a minimum of 15 inches of annual precipitation, and as a member of the pea family, it fixes nitrogen in the soil and benefits from a prairie burn allowing soil locked seeds to germinate after which it will grow more profusely. Names: Some books list the genus as the older Petalostemon, however, USDA and the University of MN Herbarium have adopted the newer classification to the genus Dalea, named for Samuel Dale, (1659-1739), an English botanist and botanical collector and author of several botanical books. 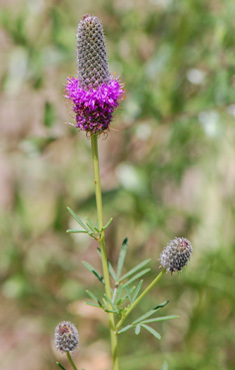 The species name purpurea is Greek for "purple". Specimens were originally collected by Lewis and Clark. (Details at page bottom.) Although originally described by Frederick Pursh, the botanist who catalogued and described the plants brought back by the exploring expedition of Lewis and Clark, the author name for the plant classification that is currently accepted is ‘Vent.’ which refers to Étienne Pierre Ventenat (1757-1808), French botanist who published several works about plants in French gardens including the rare plants of Malmaison. French gardens grew many species imported from the New World. 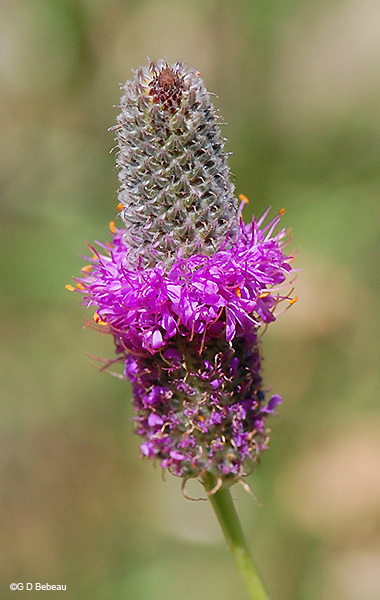 Comparisons: Purple Prairie Clover is similar in appearance to the slightly taller White Prairie Clover, D. candida, which plant also has broader leaflets. Above: The inflorescence is a dense cone-shaped spike. Drawing from Britton, N.L., and A. Brown. 1913. An illustrated flora of the northern United States, Canada and the British Possessions. 3 vols. Charles Scribner's Sons, New York. ABelow: 1st photo - Blooms of mid-July, the same time as the White Prairie Clover. 2nd photo - Near the end of the bloom period as the flowers progress from bottom to top. 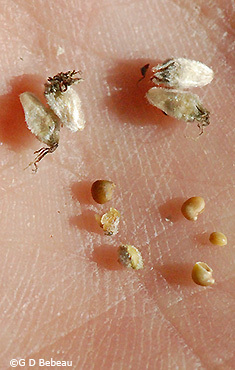 Below: 1st photo - The small seed pods have the remains of the stamens and style and contain 1 or 2 smooth seeds. 2nd photo - The narrow leaflets of the pinnately compound leaf. Below: 1st photo - A small upper leaf with 3 lobes. 2nd photo - The underside is paler in color with the gland dots most visible. They are also visible on the upper side but less noticeable. 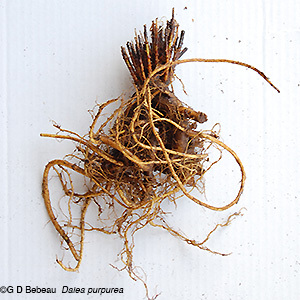 Below: 1st photo - Purple Prairie Clover has a stout tap root and many smaller fibrous root. Note the many stems rising from the root crown - typical of older plants. 2nd photo - The stamens and the style are much exserted from the corolla as the petals do not form a keel as most pea family flower do. Notes: Purple Prairie Clover was first introduced to the Garden by Eloise Butler on July 12, 1910 with plants she obtained from the grounds of the Agricultural College in St. Paul. Martha Crone planted seeds in 1944 and plants in 1945; more seeds in 1951, '52, and '53. The plant is included on her 1951 census of plants in the Garden. Cary George reported planting it in 1995. Purple Prairie Clover is native to Minnesota to all but a handful of counties - those exceptions being mostly in the NE Quadrant of the state. It has wide native distribution in the United States ranging from the Basin and Range area of the west to the Appalachians in the east. It is most abundant in the uplands of the true prairie. However a number of the eastern states report special concern for the plant such as Kentucky, "endangered" in Tennessee and considered "extirpated" (eradicated) in Michigan and Ohio. Varieties: There are two accepted varieties: Var. purpurea, as described above, which is the native Minnesota species and var. arenicola, which is restricted to the sandy soils fof the lower great plains states. D. purpurea is one of four species of Dalea in Minnesota. 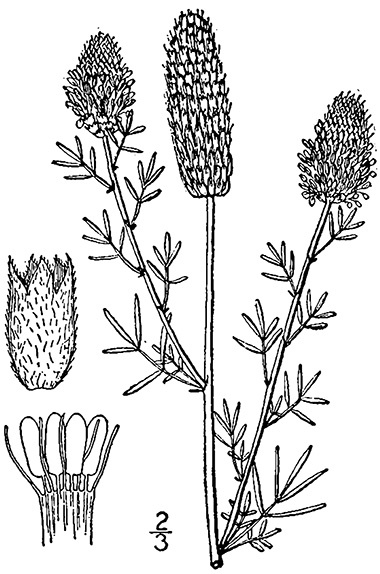 The others are the White Prairie Clover, D. candida; Foxtail Prairie Clover, D. leporina; and Silky Prairie Clover, D. villosa. Lore and use: This is a highly nutritious plant for livestock forage. It is a warm-season legume that is nitrogen fixing. Overgrazing is detrimental to it, but a burn will stimulate germination of seeds in the soil and the plant will grow more profusely. Human use is restricted to medicinal uses. It has been reported that a tea made from the taproot will reduce fever in measles victims. Meriwether Lewis (Ref. #3b) reported that bruised leaves were steeped in water and applied to fresh wounds. Densmore (Ref. #5) reports its use among the Minnesota Chippewa for heart conditions. A decoction was made from a handful of leaves and flowers in 1-1/2 pints of water. Their dosage was 1/2 cup, repeated in a half hour if necessary.